A small hand-held sensor, which is pressed against the skin surface, generates sound waves and detects any echoes reflected back off the surfaces and tissue boundaries of internal organs. The sensor can be moved over the skin to view the foot from different angles; the pictures are then displayed on a TV monitor screen and printed for subsequent review. Ultrasound can used to detect problems in the soft tissues such as Morton's neuroma, bursitis and tendon defects. What happens during the ultrasound scan? Ultrasound scans usually take between 10-20 minutes. During the scan, a gel will be applied to your skin. This gel allows the sensor to slide easily over the scannable area, helping to produce a clearer picture. 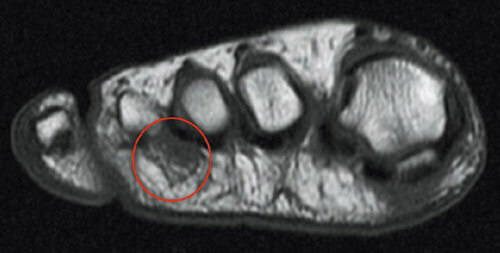 An ultrasound image showing Morton's neuroma. Where does the Ultrasound Scan take place? The Fitter Feet For Life Team can refer you to the private hospital of your choice to have an MRI scan. You will the be seen for a follow up consultation to discuss the best treatment for your condition and a member of the team will provide the treatment of your choice. This can range from conservative care such as foot orthoses, physiotherapy, laser, and steroid injection to surgery.